Mmm.. I saw a photo of these on line somewhere and know I had to make apple pie baked in the apple. They were a bit time consuming, but the family was impressed and I would definitely keep it on the list for making again!! Prepare and roll out your pie crust on parchment paper and place into the refrigerator until you are ready to use. Wash apples and cut the tops of of four of them (do not peel). Hollow out the core and some of the apple to make an apple bowl. Peel, core and dice the other 2 apples and place in a small bowl. Spoon apple mixture into your apple bowls. Pack slightly and fill to the top. Remove Pie Crust from the refrigerator and cut strips about 4 inches by 1/2 inch. Place 4 strips of the pie crust onto each apple in a lattice pattern (you can use more strips if you have them.. but I liked 4). Combine 1 tablespoon sugar and 1/2 teaspoon cinnamon in a small bowl and sprinkle on top of the pie crust lattice pattern on each apple. Sprinkle any remaining cinnamon sugar onto left over pie crust strips and place on a parchment covered cookie sheet. 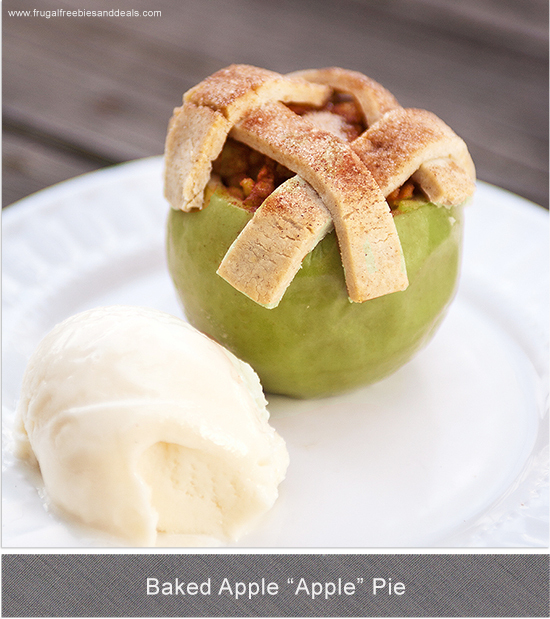 Bake Apple Pies baked in the Apple for 30-40 minutes until crust is golden and apple is soft. Bake cinnamon sugar pie crust strips for 15 minutes or until golden. 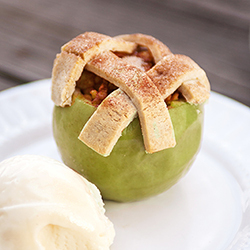 Remove Apple Pies baked in the Apple and allow to cool 5-10 minutes before moving out of the dish ( they are soft and can break if you are not careful). For more Recipes head here.. Very, very clever and creative as well as so much healthier. Always felt traditional pie had too much boring crust compared to the delicious filling. Know the nutritional value of apple skin too. Favorite thing as a child was the leftover bits of pie crusts that my Grandma would put cinnamon and sugar on. We wanted that more than the pie.